Octave Electronics Inc. CAT synthesizer ad from page 7 in Contemporary Keyboard Magazine April 1977. 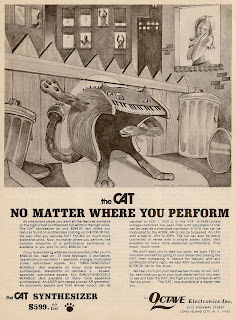 This is the second in a series of Octave Electronics' CAT ads featuring distinctive artwork that appeared in Contemporary Keyboard Magazine when the synthesizer was first introduced.You can read about the first ad here. Looking at this ad, it got me thinking about the whole cat&synth meme that currently exists on the Web. As far back as I can remember, discussions about cats and synth gear have existed both on- and off-line. Members of forums and e-mail lists such as Analogue Heaven have exchanged stories at least as far back as 1999. When matrix, owner of the popular synthesizer blog MATRIXSYNTH, was asked about the phenomenon in an e-mail earlier this month, he replied "I noticed that of all animals, cats seemed to be the most predominant in synth shots". He started posting cat&synth photos on his blog with a cat label (now synth cats) back in December 2005, and it became such a popular MATRIXSYNTH theme that readers began sending in their own videos and images featuring cats and other animals. Dogs run a close second along with birds and reptiles. Amar, creator of the CatSynth blog, started blogging about cats and synths in mid-2006, virtually unaware of the large number of others sharing the same two interests. "I started searching online for 'cats and synthesizers' and found Matrixsynth and some past articles at CDM, and it was only then I really found out the phenomenon of cat and synth pictures". Amar adds that it is not surprising to see cats with music gear. "They do like to get around and explore things and they like warm surfaces. I think a lot of musicians with cats enjoy having them as a presence in their creative spaces". Many, says Amar, refer back to the popular 'cat on a keyboard in space' image as a possible unofficial beginning to the meme - but I've yet to track down the date this image first appeared online. Regardless of when the phenomenon took off, it didn't take long for photos, videos, and everything else cat&synth to start showing up all over the Web. There is even a VSTi called the meowSynth. On a side note, another cat&keyboard meme has caught on recently - and the original VHS videotape recording apparently dates back to 1986. The 'Keyboard Cat' video meme has been described by Rocketboom's History of Keyboard Cat as the "mercy kill of the Internet". Great stuff - definitely check it out. Don't be a stranger - if you have any history to add, please comment. You'll probably have more knowledge about this than I do, but wasn't the Con Brio synthetsiser originally developed to test the hearing of cats? I've got an Octave CAT mouldering away in my parents' basement. Coincidentally enough, I had it with me when I'd first moved out of there, and I was living with a friend who had six cats (the small furry kind). The kittens enjoyed chewing on the power cable.